Location: The most remote of California's Channel Islands. It is part of Ventura County. The 14,562 acre (58.93 km² or 22.753 sq mi) island is currently controlled by the United States Navy and is used as a weapons testing and training facility, served by Naval Outlying Field San Nicolas Island. The uninhabited island is defined by the United States Census Bureau as Block Group 9, Census Tract 36.04 of Ventura County, California. The Nicoleño Native American tribe inhabited the island until 1835. As of the 2000 U.S. Census, the island has since remained officially uninhabited, though the census estimates that at least 200 military and civilian personnel live on the island at any given time. Clear Water and Tons of Life. 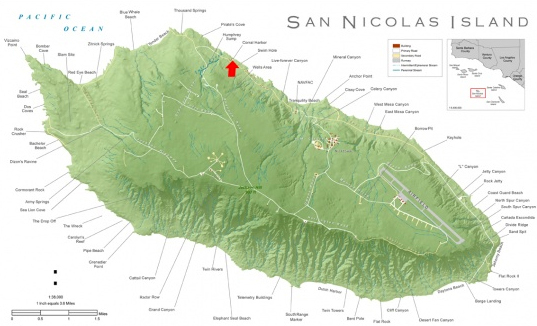 San Nicolas is one of the smallest of the eight Channel Islands, larger only than Santa Barbara and Anacapa Islands. Only eight miles long and about three and a half miles across at its widest point, it is the farthest from the mainland, more than 60 miles offshore. Via charter dive boat, it is reached only after a seven-to eight-hour ride. San Nic has been owned by the U.S. Government and under the jurisdiction of the U.S. Navy since 1933. It contains a large Navy base, which includes tennis courts, a racquet ball court, a movie theater, a bowling alley, a recreation center and a 10,000 foot runway. The island is off limits to civilians. Until fur traders eliminated them in the late 1800s, sea otters were plentiful off San Nic. A highly controversialprogram transplanted 139 otters from Monterey on the island between 1987 and 1990. Only 16 remain. About half swam back to Monterey, some died, and many are unaccounted for. At the time of the transplant, divers and fishermen worried that the otters would ruin San Nic's abalone/lobster fishery; little did we know humans could decimate the abalone population all by themselves. 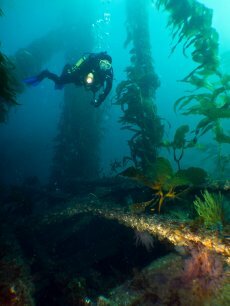 San Nic has always been one of the least dived Channel Islands because it is so far offshore. As a result, the island was legendary for the large red abalone and spiny lobsters it produced. If you've got a dive trip planned to San Nic , go with a boatload of good friends, a good book or both. Charter dive boats usually leave at 9:00 or 10:00 p.m. the night before in order to be there at 6:00 or 7:00 a.m. While you'll sleep most of the way there, it's a long trip back!